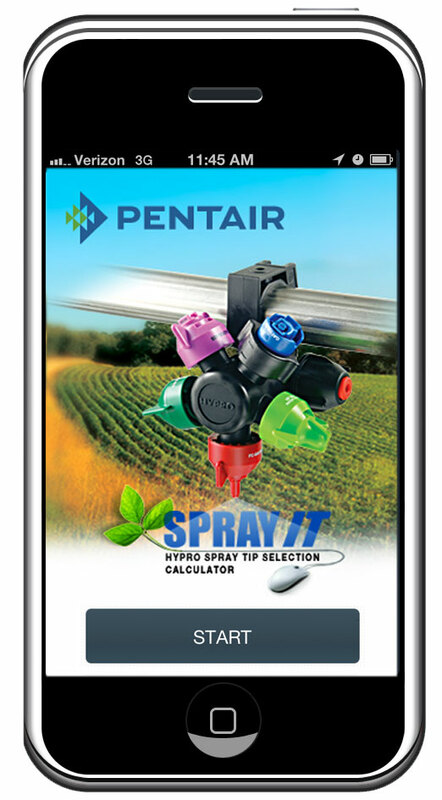 February 4, 2013 — Hypro continues to make spray tip selection simple by releasing a new mobile app that takes your application information and provides a customized list of spray tip recommendations. Users simply enter their tip spacing, speed, application rate, solution density and droplet size requirements and the SprayIT mobile app does the rest. The Hypro SprayIT app is available for Apple and Android mobile devices and supports both U.S. and Metric units. The app is available in multiple languages including English, Spanish, Portuguese, and French. To receive more information on the new SprayIT mobile app, visit www.hypropumps.com. Hypro is the leading provider of the highest quality fluid handling products, systems and accessories. Hypro’s line of products includes roller, centrifugal, diaphragm, turbine, piston, and plunger pumps, as well as spray tips, nozzles and accessories. Hypro is a brand of Pentair, Inc. and is located in Saint Paul, Minnesota.